[tiny garage] experimental sound series contributes to chicago’s DIY legacy by providing a unique platform to explore the relationship between architecture and time-based practices. chicago has a rich history of activating unique spaces as exhibition venues; [tiny garage] contributes to this legacy while looking at the garage as a place for escape, invention, ambition, and creativity. 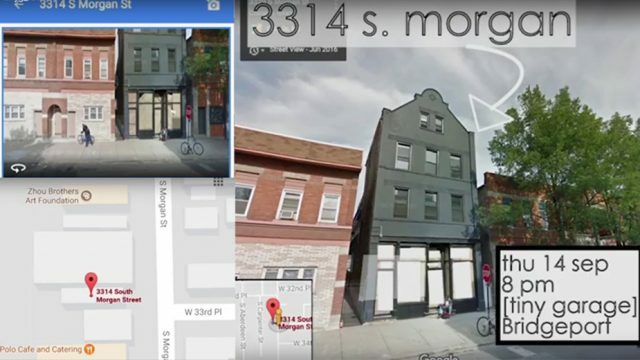 Four chicago curators explore a causal link between architecture and performance art, sound art, glitch, and experimental music – embraced by the studded walls of a two car garage behind Defibrillator Gallery. Jeff Kolar: [jeffkolar.us] is an independent sound artist, radio producer, and curator working in Chicago, United States. He is the Founder and Artistic Director of Radius, an experimental radio broadcast platform established in 2009. His work, described as “speaker-shredding” (Half Letter Press), “wonderfully strange” (John Corbett), and “characteristically curious” (Marc Weidenbaum), activates sound in unconventional, temporary, and ephemeral ways using appropriation and remix as a critical practice. His solo and collaborative projects, installations, and public performances often investigate the mundane sonic nuances of everyday electronic devices. His work has been released on a variety of record labels including Panospria + No Type (Canada), H.A.K. Lo-Fi Record (France), free103point9 (US), Amigos Publishing (US), and has appeared in compilations by Furthernoise.org, iFAR (England), Phantom Airwaves (US), and Sonic Circuits (US). His video work was published in the DVD journal ASPECT: The Chronicle of New Media Art. Joseph Ravens: [josephravens.com] is an artist, curator, and educator who studied audiovisuals at the Gerrit Rietveld Academie [Amsterdam, Netherlands] before earning his Masters of Fine Art in Performance from The School of the Art Institute of Chicago. Ravens is a two-time recipient of the Illinois Arts Council Fellowship which, along with other grants and awards, has allowed him to build an international reputation. Ravens was included in 7a*11d (Toronto, Canada 2016), Bienal DEFORMES (Santiago, Chile 2016), Live Biennale Vancouver (Canada 2015), 20th Bienal Internacional de Curitiba (Brazil 2013), Venice International Performance Art Week (Italy 2012), and Intrude: Art and Life 366 (Zendai Museum, Shanghai, China 2008), among others. Ravens is founder and director of Defibrillator Gallery and co-founder and director of Rapid Pulse International Performance Art Festival. Jon Satrom: [jonsatrom.com] Satrom performs realtime audio/video noise and new-media (often w/ XTAL FSCK, I ♥ PRESETS, & Magic Missile), develops artware (in partnership w/ PoxParty), and has co-programed and experimented with organizational and curatorial systems w/ dirty new-media & glitch comrades (including GLI.TC/H && r4wb1t5!.). He has performed, workshopped, and lectured across spaceship earth (at places like: STEIM, Amsterdam NL; musicacoustica, Beijing CN; transmediale, Berlin DE; The Museum of Contemporary Art, Chicago US; Centro Multimedia, Mexico City MX; SXSW Interactive, Austin, TX US ). His works have been experienced and featured within white cubes, glowing rectangles, ( 65GRAND, Chicago IL US; Boulder Museum of Contemporary Art, Boulder CO US; MU Eindhoven NL; NUMA, Paris FR; Seoul Museum of Art, Seoul KR; and SUDLAB, Naples IT; ) and dead trees (GLI.TC/H READE[R0R]; Handmade Electronic Music: The Art of Hardware Hacking; Interface cultures: Artistic Aspects of Interaction; Mobile Digital Art: Using the iPad and iPhone as Creative Tools and The Art and Science of Interface and Interaction Design).